However, the promise doesn't address other fossil fuel issues unique to Canada's north, such as diesel for remote power generation. The federal government has committed to exempting aviation fuel used in Nunavut, Yukon and Northwest Territories from the country’s carbon tax. Under Ottawa’s carbon pricing plan, the federal government will place a surcharge of $10 per tonne on carbon-based fuels — mostly diesel — which is set to increase in price to $50 per tonne by 2022. But since the federal government first floated the idea of a carbon tax in 2016, it’s received a backlash from Nunavut and other northern communities that rely on diesel. The Government of Nunavut has been clear in its opposition to a carbon tax and will not create its own carbon pricing; instead, Ottawa will collect its own backstop carbon tax and return the revenue to the GN. But earlier this week, the federal government finally responded to some of the territories’ concerns and requests for exemption. In a June 18 letter addressed to the Senate and co-penned by Environment Minister Catherine McKenna and Finance Minister Bill Morneau, the ministers acknowledged the impacts of pricing pollution in remote regions. “We know that Canadians living in the many fly-in communities in the territories rely on aviation for the essentials of life, including medical care and supplies,” McKenna said in the letter. At the same time, the federal government said it’s also working with territories to help households and businesses reduce their reliance on fossil fuels. For its part, the GN said it’s been pushing the federal government to recognize Nunavut’s energy needs. “Canada’s decision to exempt aviation fuel from its carbon pricing system shows they are listening to us, and is a first step towards meeting their commitment in the Pan Canadian Framework,” said a GN Finance department spokesperson in an email. “Our Qulliq Energy Corporation relies entirely on high-carbon diesel to generate electricity, and the price of electricity is already extremely high. Unlike elsewhere in Canada, Nunavut cannot look to lower-carbon technologies. Nunavut Senator Dennis Patterson, who has called for Nunavut’s exemption from the tax, welcomed the government’s pledge as a “positive first step” in recognizing the unique challenges of living in the North. However, he said in an interview, many questions remain about how the carbon tax will be applied. For instance, “it doesn’t appear to apply to Nunavik, which is a little odd,” said Patterson. 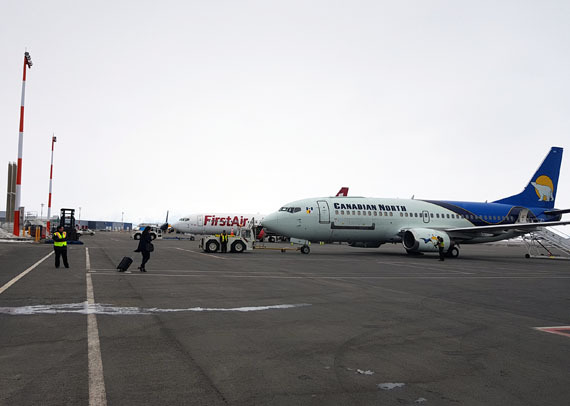 “An airline like First Air serves Nunavik and Nunavut. They even some have some Nunavik flights that connect with Iqaluit. As well, aviation fuel only makes up about 20 percent of Nunavut’s fossil fuel consumption, said Patterson. It remains to be seen whether the federal government will help ease the pain of rising costs for heating oil, diesel-generated electricity and gasoline. “We’re still waiting for the details on 80 percent of Nunavut’s fossil fuel consumption,” he said. To date, Nunavut has only received “vague promises” for assistance with offsetting those rising costs, he said. Patterson also remains concerned about the impact of carbon pricing on Nunavut’s mining companies, which he says should be treated differently than companies operating in southern Canada, closer to ports, roads and power grids. Once implemented, the new tax is estimated to cost Nunavut households about $3 million in the first year and up to $11 million a year by 2022, a report prepared for the GN found last year. The federally imposed tax will, however, return about $15 million in revenue to the territory, the GN has said, and how the territory intends to use that revenue will be contained in the GN’s 2019-20 budget. It’s not yet clear how the new exemption would affect those numbers. Provinces and territories have until the end of 2018 to submit their own carbon pricing plans before a national price is imposed. Currently, carbon pricing is already in place in four provinces: Alberta, British Columbia, Ontario and Quebec. John Thompson contributed to this report.